With the rise in digital printing, companies are able to use variable data in creative ways to engage their customers. This growing trend toward personalization started out with direct mail. McDonalds used variable data to serialize the Monopoly game pieces for its popular promotion. More recently, variable data is increasingly being used for personalization. Household names like Coca-Cola, Heineken and others are using personalization campaigns to target niche audiences, but it’s not just for food and beverage companies. Companies are increasingly discovering that personalization is a smart way to market to specific groups, such as millennials. It’s also a good strategy for targeting a market that may not be at its purchasing peak, whether this is an age group or a specific geographic area. Targeting specific customers can help them relate to a brand on a more personal or even emotional level as the company is creating something that speaks to the customer more fully. In other words, purchasing a personalized product helps the customer reflect his or her own identity. Personalization is a big topic in the marketing world right now, and it generally meanscompanies send out direct mail that includes customers’ names, although this isn’t the only application. 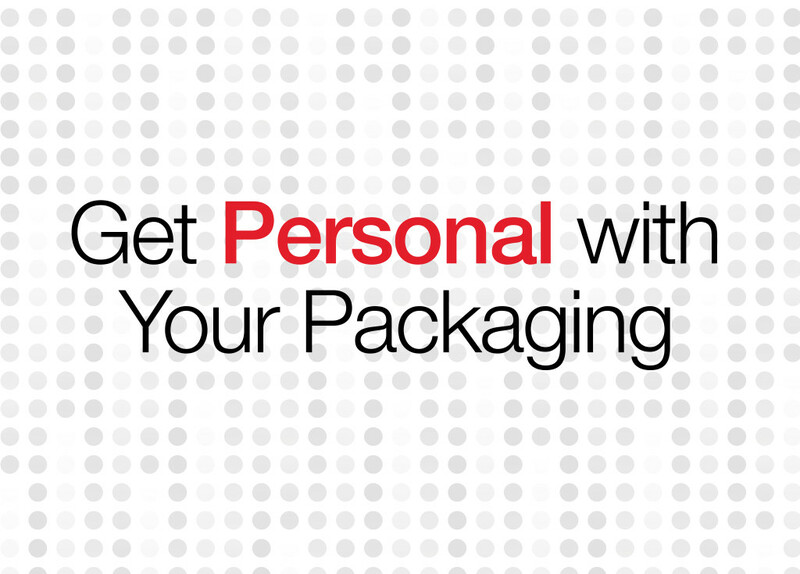 Most recently, the personalization phenomenon has also taken hold in the packaging world as a way to reach customers on a deeper level. The most prominent example of personalization through the use of first names is Coca-Cola’s recent “Share a Coke” campaign, for which the company printed 250 of the most popular names on 20-ounce bottles of Coca-Cola products. Coke also expanded this to other bottles and can formats. It was an impressive, large-scale campaign that also encouraged customers to share images online using the #shareacoke hashtag. Still, names aren’t the only personalization approach that companies can use to gain customer attention. Personalization is employed any time a company utilizes digital printing to reach a variety of different targets. In fact, Coke didn’t just utilize names in its campaign, but also popular phrases like “BFF,” and “The Team,” “Family” and “Wingman,” which are also targeted to specific groups, like teenagers, office workers and families. While personalizing items with first names is often the first thing people think of when the term “personalization” comes up, there are many other approaches to take, and opportunities for companies to create really innovative, engaging promotions. Targeting different markets by geographic area, interests and demographics are key ways that companies can personalize their product labels and packaging to specific groups. Leavy Vicars, Packaging Advisor at Nosco, suggested targeting a geographic region by printing packaging with graphics related to the local sports teams, or even targeting users by specific interests, such as fishing, camping or boating. Targeting customers by age group can also be an effective use of personalization, which could even have uses in the Medical Device market, for instance, aiming EpiPen packages at different age groups using popular cartoon characters from Spongebob or Disney. In addition, a handful of companies have launched campaigns that invite customers to design their own products. Kleenex allowed customers to create individual boxes that match their own homes. Heineken provided an option to customize six-packs of its beer in Europe, too. While forward-thinking companies in many market segments have started using the approach more, there is substantial opportunity for growth in others. Digital printing makes easy implementation of variable data seamless, which has different applications for different markets. Serialization is a great benefit for Healthcare markets, while personalization campaigns could be utilized successfully in Personal Care and Natural Health, among others. The printing process for implementing variable data is very easy. On the other hand, the planning and strategizing process can be significant. Unrolling a personalized campaign can often be cumbersome because it requires research and strategy to create a unique and effective promotion that draws targeted customers. Working with an innovation-focused printing and packaging partner can help companies strategize and determine the best approach to their personalization campaigns.